The markhor is an Asian mountain goat species found in the western Himalayas. Markhors weigh between 88 and 243 lb, and males are larger than females. The average body length is 55 to 70 inches. Their coats are grizzled light brown to black in color (depending on the subspecies), and the coats of males are usually lighter than that of females. In the summer, their coats are short and smooth, and in the winter they grow longer and thicker. Males have long hair on their chin, throat, chest, and shanks, and females have smaller fringes. Both male and female have tightly curled, corkscrew-like horns that start close together at the head and spread out toward the tips, but the horns of males grow about six times longer. The markhor can be found in the mountains at elevations as high as 3600 meters in scrub forests made up of primarily oaks, pines, and junipers. They are mainly active in the early morning and late afternoon. They graze mainly during the spring and summer feeding on a variety of grasses. During the autumn and winter months, they eat leaves, twigs, and shrubs. Males are solitary and females and their young live in herds of around nine. Mating occurs in the winter, and males fight for breeding rights by lunging and locking horns to make the other lose its balance. 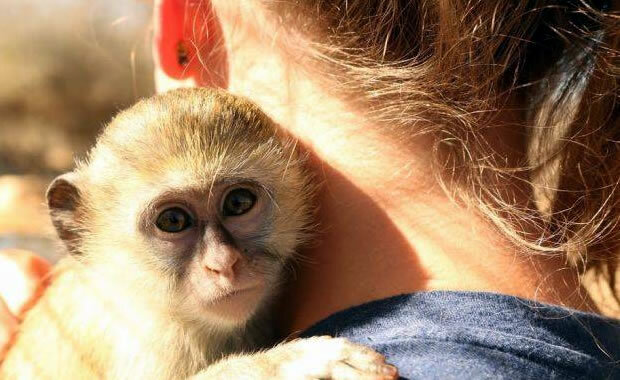 Females give birth to one to two young after a gestation period of 135 to 170 days. Three markhor subspecies are endangered: the Chiltan markhor or Chiltan Wild Goat (Capra falconeri chiltanensis) found in Pakistan, the Straight-horned markhor (Capra falconeri jerdoni) found in Afghanistan and Pakistan, and the Kabul markhor (Capra falconeri megaceros), also found in Afghanistan and Pakistan. The Chiltan markhor may also be called Capra aegagrus chialtanensis because there is much controversy regarding its classification as a Capra falconeri subspecies, and some argue that it is a subspecies of the wild goat (Capra aegarus). All three subspecies are threatened due to hunting by humans. Their horns are prized among trophy hunters and used in the Asian medicine market. They also compete with domestic livestock and local agriculture for habitat. All three subspecies were listed as endangered in 1976, but there are no other known conservation plans for the species. Copyright Notice: This article is licensed under the GNU Free Documentation License. It uses material from the Wikipedia article "Markhor". Glenn, C. R. 2006. 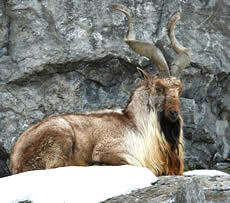 "Earth's Endangered Creatures - Markhor Facts" (Online). Accessed 4/25/2019 at http://earthsendangered.com/profile.asp?sp=255&ID=8.